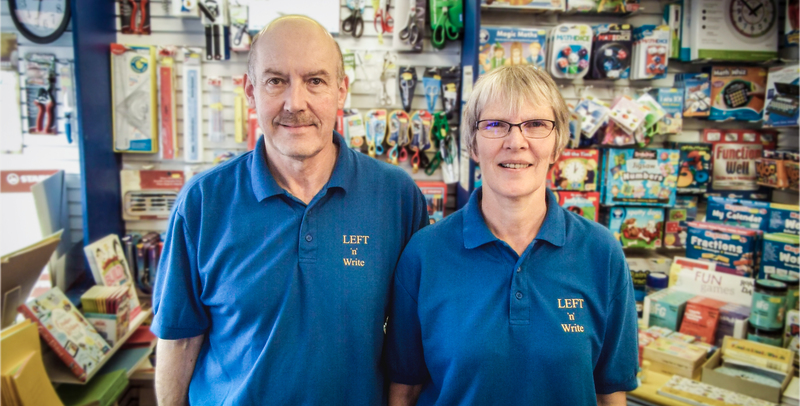 LEFT ‘n Write is a small independent run by Mark and Heather Stewart shop specialising in the advice and provision of everything left-handed, with a focus on helping left-handed children excel at writing. LEFT ‘n Write of Worcester is spearheading the campaign to have specific guidelines on helping left-handed children included as part of Initial Teacher training and within current in-service training. Mark and Heather have co-written the “Left Hand Writing Skills” set of 3 Handwriting practice books and designed a “Writewell” mat. In August 2017, they co-authored “So You Think They’re Left-Handed?”, a book of discovery or confirmation for parents, carers and Early years practitioners designed to confirm the laterality of a child aged 2 to 4. Includes 16 pages of Pencil activities and 16 pages of Scissor activities. As well as helping children at the shop, Mark Stewart runs courses for schools and other educational providers such as LEA’s, Nursery & Pre-school Learning Alliance Groups. One-to-one tutoring is also available. If you are looking for help and advice, either as a Teacher or as a Parent to help left-handed children, you have come to the “RIGHT” place! !